For many people asparagus season is the culinary high point of spring, but I couldn’t care less. But come the new season potatoes, and you got my undivided attention! The spring is very late in Finland, so we have to wait still for domestic new season potatoes, which naturally are the best in the world (that means second to none, Pille) ;) Luckily countries such as Israel, Morocco and Cyprus provide us with very early potatoes. However, those are much larger and not nearly as sweet as their tiny, almost skinless Finnish cousins. To cook a domestic new season potato, it’s enough to rinse them under a running water, and the skin will fall of with a slightest rub of a hand. New season potatoes taste absolutely fantastic with nothing but some butter with them, but add some marinated herring and onions, and you’ve got a meal fit for kings. I especially like herrings made by a Swedish company Abba – The band ABBA actually asked their permission to use the same name. Abba Seafood was founded in 1838, ABBA the band in 1972 :) Abba has a large selection of herring in different marinades, by favorite being a French Onion marinade. IKEA sells some Abba herring products and other Swedish delicasies in all of their stores worldwide. Boil the potatoes. Slice the onions and the pickles. Serve the potatoes with fresh butter on top and herrings straight from the jar. Garnish with some fresh dill. In the picture above I also had some wild mushroom salad. Ok, Antti – I really hate marinated & salted herring, whether Abba brand or not (a staple at home – I leave the kitchen the moment my mum starts cleaning them and refuse to come back until she’s covered them in sour cream and put away in the fridge! ), and there is a missing ‘second’ in the beginning of your second paragraph;) But I love the plating of your meal, and I really crave some new season potatoes now!! Mmmm – and the wild mushroom salad, obviously..
Pille – I hear you loud and clear – herring fillets that need cleaning are totally gross and disgusting! Every xmas mom makes a huge batch of rosolli (herring salad with beets, onion, pickles, apple, carrots and whipped cream), and I almost vomit when I see the salted, whole herring fillets. I couldn’t imagine a xmas meal without the rosolli however, and the finished product is super, super good. Just to reassure the other, unprejudiced readers: Abba marinated herrings are super good, 100% boneless bite-sized pieces, and can be eaten straight from the jar! $20/lb potatoes – YIKES! Some time you need to do a post on how a proper Finn properly eats a proper Finnish potato! As for marninated herring, well, I don’t think I’ve ever had it (though, I fondly remember my grandfather consuming it by the jar-ful) but I am inspired now! Oh! What I wouldn’t give to have some of those “world’s best” potatoes! You are making me miss my short stay in Finland…that photo is going to make me cry. I love marinated or raw herring, especially with onions…I hope I can find some good ones here, maybe in one of the better delis…cross your fingers for me please! Rachael: Good to see you again :) And I’m relieved to see you have started cooking again albeit your new job – I hope the same happens to me too, soon! Joey: My fingers are crossed for you =) I hope you find the herrings… Definitely try IKEA first, they sell all kinds of Scandinavian food-goodness in their stores. I would love to find a good recipe for making marinate herring–the kind that is found for sale in jars in Finland–out of ordinary, fresh herring. 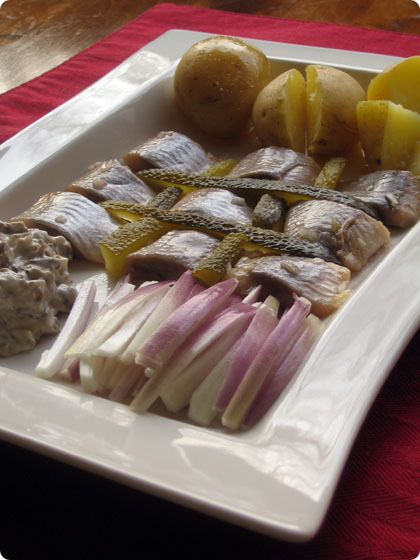 All of the recipes I find on line are the more Americanized versions of pickled herring, which is not nearly as tasty as the wonderful kinds you can buy in every grocery store in Finland. I know that the process is not difficult, but I think it’s all in knowing the correct proportions of vinegar to sugar, as well as thy type of vinegar and the spices used. I would greatly appreciate any help you might have in bringing a bit if Finland into my kitchen. Albeit I used pre-canned herrings, you can very well use fresh ones as the pickling liquid is suitable for fresh herrings also.